At Dallas Podiatry Works, we love to see families encourage their kids to be active. Even if your little one doesn’t much care for organized sports, vigorous outdoor play is good for developing healthy bodies and minds. Plus, most kids seem to have boundless energy anyway! Unfortunately, that energy can be sapped quite quickly if your child begins struggling with heel pain, especially as a result of sports or athletic activity. 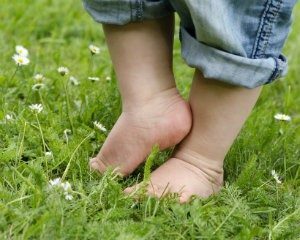 Heel pain can be very distressing for both children and parents, as it stops your little one from engaging in activities they typically enjoy. The good news is that most cases of sports-related heel pain in children are temporary and can be resolved with conservative care. However, it’s still very important to seek out treatment right away. Heel pain that goes undiagnosed and untreated while kids continue to play can lead to chronic complications. If your child’s heels hurt from soccer, basketball, or other sports or active play, bring them in to see the team at Dallas Podiatry Works. Most of the time in these situations, the problem is an injury to the growth plate in the heel bone—also known as calcaneal apophysitis, or Sever’s disease. The growth plate is an exposed, softer area of bone tissue, and doesn’t reach full maturity until around age 15 (give or take a few years). It is especially vulnerable during growth spurts, and participation is sports is a major risk factor for injury. At a minimum, your child may have to take a break from sports for a few days to a few weeks in order to give their heels a chance to recover. Depending on the results of our examination, we may recommend other treatment options as well. This could include things like icing the heel to control swelling, performing calf stretches and other exercises to reduce pulling and pressure on the growth plate, buying your child a better pair of shoes, or prescribing an appropriate prefabricated or custom orthotic device to provide additional support and cushioning. With the proper corrective and preventative treatments in place, your child will be back on the field soon, and eventually they will grow out of the condition as they age. If your child is in pain, limping, or struggling through their favorite sports or activities, give us a call today at 972.566.7474.